9:20 - Journalist Allie Gross surveys the chaos created by Detroit's speculative housing market. Allie wrote the article Detroit real estate game creates chaos in neighborhoods for the Detroit Free Press. 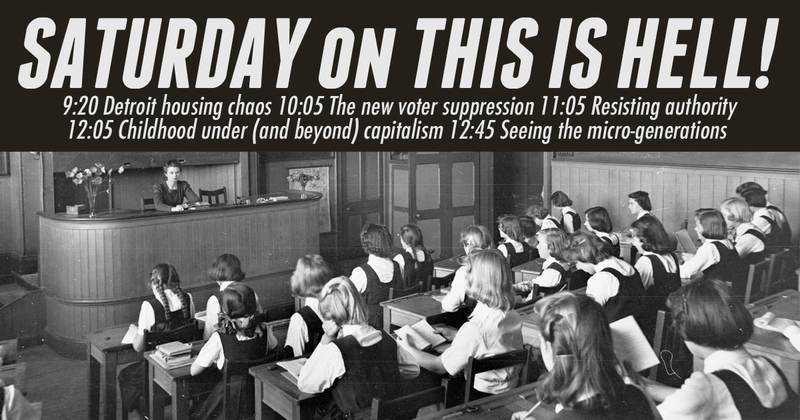 10:05 - Historian Carol Anderson examines the new mechanisms of voter suppression in America. Carol is author of the book One Person, No Vote: How Voter Suppression Is Destroying Our Democracy from Bloomsbury. 11:05 - Psychologist Bruce E. Levine explains why authoritarian times call for anti-authoritarian people. Bruce is author of the book A Thinking Person’s Guide to Being an Anti-Authoritarian - Strategies, Tools, and Models from AK Press. 12:05 - Writer Megan Erickson looks at the realities of childhood beneath (and beyond) capitalism. 12:45 - In a Moment of Truth, Jeff Dorchen discovers micro-generations.